Newcastle United's proposed takeover appears to be in doubt, with potential buyers reportedly unable to meet Mike Ashley's requests. 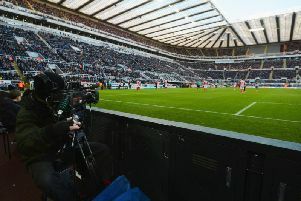 It was understood the Newcastle owner wants in excess of £300million for the club, though none of the interested parties have met his asking price. Former Chelsea and Manchester United chief executive Peter Kenyon is leading a consortium interested in purchasing the club but, following months of speculation, a potential takeover is beginning to wane. Latest reports from i News claim Ashley now wants £200million to enter into full takeover talks, and will them seek add-ons to take the club’s valuation close to the £300million mark. It is believed Kenyon is trying to make up the £200million required but, after holding initial discussions, falls short of Ashley's valuation. Newcastle slipped into the relegation zone following Saturday's 2-1 defeat at Chelsea. Ashley was present at Stamford Bridge as goals from Pedro and Willian condemned the Magpies to their 12th league defeat of the season. The Newcastle owner didn't meet Magpies boss Rafa Benitez after the full-time whistle and must quickly decide whether to back his manager in this month's transfer window. Newcastle spent a reported £17million on players in the summer transfer window and recorded the lowest net spend in the Premier League, making a reported £28.2million profit.